The Songs of Eretz Poem of the Day for June 2, 2014 is "Written in Very Early Youth" by William Wordsworth, the Songs of Eretz Poet of the Month. Details about the Poet of the Month feature as well as a biographical essay about William Wordsworth may be found here: http://eretzsongs.blogspot.com/2014/06/songs-of-eretz-poetry-review-poet-of.html. The poem takes the form of a rhyming sonnet written in iambic pentameter. It is not broken up into stanzas, nor does it fit a standard Shakespearean 4-4-4-2 or Italian 8-6 scheme. The rhyme scheme is a rather complicated abbaaccadeffaf. "Kine" is an archaic word for "cows" http://www.merriam-webster.com/dictionary/kine. Here we see Wordsworth's love of the natural and the pastoral. 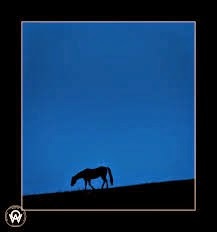 The poet is out for a quiet walk at night, as evidenced by "dark is the ground" and "a slumber" stealing over "the starless sky" and the horse eating "his later meal." The poet finds a healing power "in this blank of things." The poet's peace is intruded upon by his senses, perhaps a chill in the air, perhaps aches and pains both physical and especially mental--for he only feels "at rest" when "memory is hushed." The poet cries out to his "Friends," presumably the elements of the pastoral scene, to "restrain those busy cares" so that they will not distract him from full immersion in the "calm" of the natural world. However, the choice of the word "allay" is perplexing when a word meaning "increase" not "alleviate" is called for. I am going to be so bold as to suggest that that the great poet made a great typo here.